towards higher degrees (Masters, Doctorate or PhD) see adult patients under the supervision of senior clinicians who are both registered clinical psychologists and academic staff of the University. Please contact us directly to discuss comprehensive cognitive and educational assessments for people aged 17 years and younger. 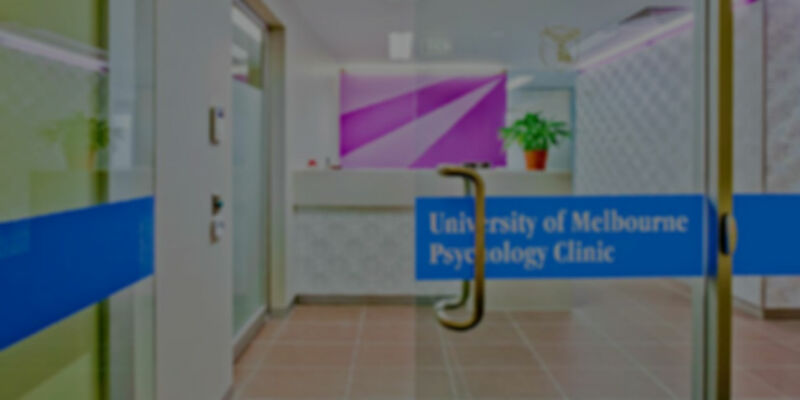 The University of Melbourne’s Psychology Clinic is a teaching clinic that provides low-cost, high quality clinical services to people living in Melbourne. The Clinic is a component of the University's professional training program in Psychology and has been running since the 1970's. Postgraduate students working towards their clinical degrees (Master of Clinical Psychology, or Master of Clinical Psychology/PhD) see patients under the supervision of The University of Melbourne’s faculty members who are senior clinicians and registered clinical psychologists. Registrars in clinical neuropsychology will also be providing services under the supervision of senior clinicians from mid-2018. Internships and work experience are not able to be offered at the University of Melbourne Psychology Clinic. Monday, Tuesday, Thursday & Friday 9 am to 5 pm. Closed on Wednesday Reception closes at 3 pm daily. Clinic is closed on public holidays. Our psychological assessment and counselling services cost $25 per session. University of Melbourne students can attend the Clinic for $10 per session. Resources and links to other services offering counselling or mental health support.